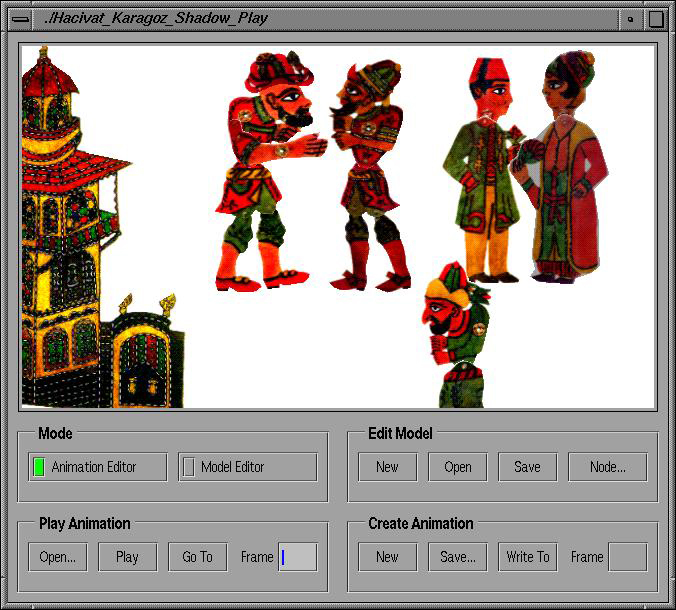 My interest in Computer Art/Computer Graphics is motivated by implementing a modeling and animation system for the traditional Turkish Shadow Theater, called Karagoz. The first performances of Karagoz (Karagheus), the traditional Turkish Shadow Theatre, date back to the 16th century. It was one of the most popular forms of entertainment right up until the cinema replaced it in the late 1950s. 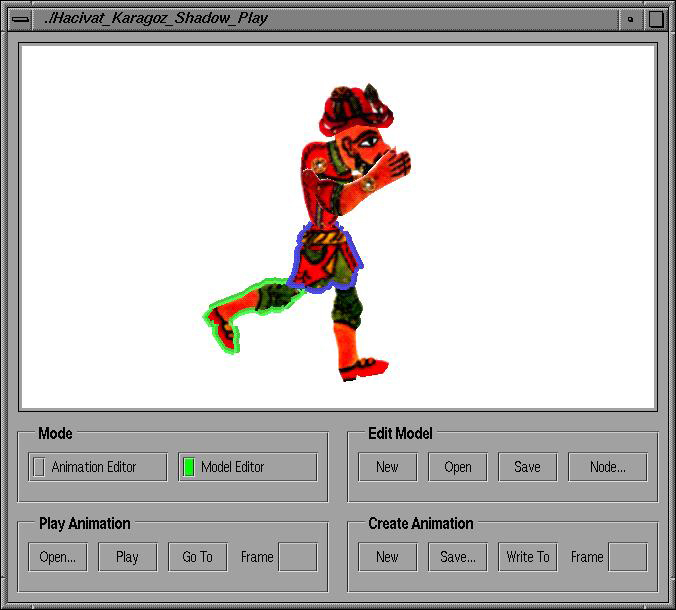 The shadow play is performed on a translucent screen by manipulating shadow play characters, like Karagoz and Hacivat, behind the screen. The characters are manipulated by using sticks attached to different parts of the characters. While the characters are manipulated, the light source behind the screen causes the shadows of the characters to appear on the screen. See our articles  Ugur Gudukbay, Fatih Erol and Nezih Erdogan, "Beyond Tradition and Modernity: Digital Shadow Theater," Leonardo, vol. 33, no. 4, 264-265, [Artist's Statement], August 2000. Ugur Gudukbay and Tolga Abaci, "Karagoz: A Hierarchical Modeling and Animation System for Turkish Shadow Theater", Fine Art Forum, Vol. 16, Issue. 1, January 2002 [Electronic Journal: Available at http://www.fineartforum.org/Backissues/Vol_16/faf_v16_n01/ text/karagoz.html]. 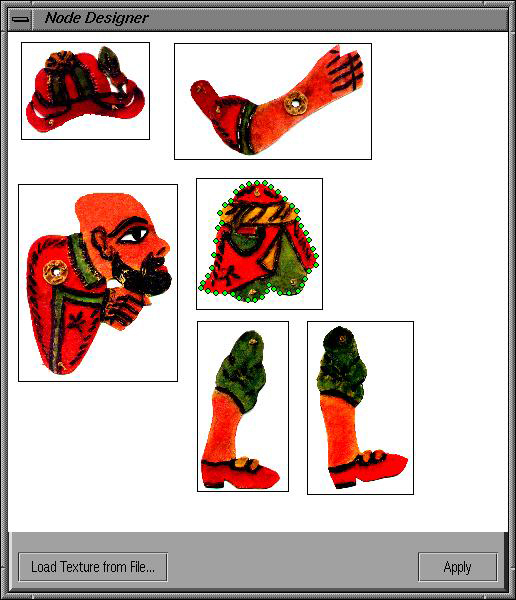 Although the techniques we used in the implementation of the animation system are well known, there is not an animation system for the Turkish Shadow Theater. The system, called Karagoz, uses hierarchical modeling to construct and animate two-dimensional articulated characters containing body parts and joints between these body parts. Different characters that have different body parts and joints have different hierarchical structures. Texture mapping is used for rendering the characters since different body parts are modeled as simple two-dimensional polygon meshes and have a predefined texture that can be mapped to these polygons as the model animates. To animate the models, the system uses keyframing based on the model parameters of the characters. These model parameters include the positions and orientations of the characters and the joint angles between different body parts of the characters. The system consists of two parts: The animation editor that is used as an authoring tool to create keyframe animations, and the model editor, that is used for creating the models used in the animations, (e.g., Hacivat and Karagoz). The most important feature of Karagoz is its ability to support characters with an arbitrary structure. This is possible since in Karagoz, hierarchical modeling is implemented in a generic way, and direct manipulation techniques are used in the user interface, which eliminate the need for character-specific control knobs. For this particular animation system, the well-known techniques, such as hierarchical modeling and texture mapping, suffices to develop such a system. However, more sophisticated animation techniques such as physically-based modeling techniques, could be used to improve the animation system. I can describe my favourite environment as one containing a. Computer Graphics Specialists who can apply Advanced Modeling and Animation Techniques, b. Artists who can design and produce the characters needed, c. Modeling and Animation Tools, such as Maya, and d. High-performance computers. Inclusion of such techniques in software tools that artists and graphics designers use improves the performance of these people and the quality of the work they produce.